Plan Your Next Family Vacation in Grand Junction! Whether you visit for a day, a week, or a month, Grand Junction and the surrounding area is full of unlimited activities and recreational opportunities perfect for a family getaway. Here is a three day sampler to help you get started! 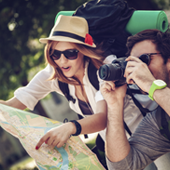 Accommodations: For a list of Grand Junction hotels, bed & breakfasts, RV parks/ campgrounds, and vacation rental homes, please visit the Lodging section of our website. Restaurants: For additional restaurants, please visit the Restaurants and Dining section of our website. Canyon Rim Trail Walk – Hike/Walk Canyon Rim Trail - 0.5 miles (0.8 km) one way. Level trail following the cliff edge above Wedding Canyon. Outstanding views make this a favorite for landscape and wildlife photography. Start at the Visitor Center or Bookcliffs Overlook. Serpents Trail Hike – Called “the Crookedest Road in the World,” this historic trail has more than 50 switchbacks. The trail climbs steadily from east to west. Built in the early 1900s, this route was part of the main road until 1950. Allow 2–3 hours for the hike. Tip: Check out a backpack from the Colorado National Monument Visitor Center full of activities and tools to help your family explore the Monument in more depth. Kids can even be be a Junior Ranger and earn a certificate and badge! Learn the history of the dinosaurs in western Colorado and surrounding areas in this hands-on interactive museum with real fossils, cast skeletons, and robotic reconstructions of dinosaurs. Kids will enjoy uncovering actual Jurassic dinosaur bones in the "quarry site", shaking things up in the earthquake simulator, and watching paleontologists in the lab prepare bones for display. The area surrounding Grand Junction is rich with trails perfect for a day of single track bliss. With a trailhead practically in the town of Grand Junction, Lunch Loops is one of the best, most accessible recreation spots in Grand Junction. With a wide variety of trails ranging from easy to very difficult, there’s something for every level of mountain biker. Explore trails here. Enjoy Grand Junction’s downtown district featuring a variety of unique gift shops, boutiques, antique stores, and Enstrom’s Candy (known for its world famous almond toffee!) Downtown is also home to Art on the Corner, a collection of over 100 outdoor sculptures. 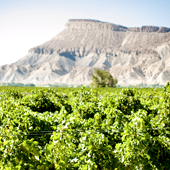 High Country Orchards / Colterris Wines overlooks the scenic Colorado River with panoramic views of the entire Grand Valley and Book Cliffs. An orchard tour gives you a behind the scenes look at the process of growing and harvesting peaches, as well as packaging and distributing them. The property also features a small vineyard and Colterris Wines, one of the newer wineries in the Grand Valley. Tip: If you are looking to pick your own fruits or vegetables in an orchard or farm, check out the "Pick Your Own" section on our website. We suggest calling before visiting to confirm availability. Nestled in the heart of peach and wine country overlooking Mount Garfield is Suncrest Orchard Alpacas, LLC. The farm maintains a herd of approximately 35 alpacas and welcomes visitors for interactive and educational tours to see these amazing animals up close and personal. In addition, the tour shows guests from start to finish the process of transforming alpaca wool into processed fibers, yarn and other products, many of which are for sale in the on-site farm store. Take a trip with Jet Boat Colorado and experience the most exciting boat tour on the Colorado River. From its base on the banks of the Colorado River in De Beque, guests board an 11-passenger custom designed New Zealand style jet boat and cruise through the breathtaking scenery of Colorado’s mountains and canyon country. With the choice of both scenic or adventure jet boat tours, most ages can be accommodated. Adventure trips features cowboy spins, fishtails, power slides and speed runs sure to generate a surge of adrenaline on this wet and wild ride. Drivers slow things down on the scenic trips and share the history, geology and lore of the Colorado River. Open mid-May through mid-September. The Grand Junction area is rich with options for stand-up paddleboarding, including locations on the Colorado River, Highline Lake, Connected Lakes, or even one of the many lakes on Grand Mesa just to name a few. For those new to the sport of paddleboarding, lessons are offered by several area outfitters including Grand Junction Stand Up Paddleboarding Co. and Rapid Creek Cycles & Paddleboards. Rentals are also available. Learn the basics of paddle boarding, including paddle strokes, safety, and river running. Tip: Families with younger children might prefer a mellow rafting or float trip down the river. There are plenty of companies offering guided river trips and equipment rentals to meet your needs. The Little Book Cliffs Wild Horse Range, located just eight miles northeast of Grand Junction, CO, is one of only three ranges in the United States specifically designated to protect and manage wild and free roaming horses on public lands. Approximately 80 to 130 wild horses roam the 36,000 acres of rugged canyons and plateaus which are covered in sagebrush and pinyon-juniper. Some of the wild horses in the Little Book Cliffs herd trace their ancestry back to Indian ponies that were introduced by the Spaniards in the 1500s, but most are descendants of horses that either escaped from or were turned loose by farmers or ranchers. Visitors can access the Little Bookcliffs Wild Horse Range with either a 4-wheel drive vehicle or by horseback. Rimrock Adventures offers guided horseback rides to see the wild horses; these trips typically last 2-4 hours, depending on the length of time it takes to encounter them. In addition to viewing wild horses, the ride also offers plenty of opportunities to enjoy beautiful scenery and the chance to see other desert wildlife. "Pick Your Own" option for lavender during most of July.